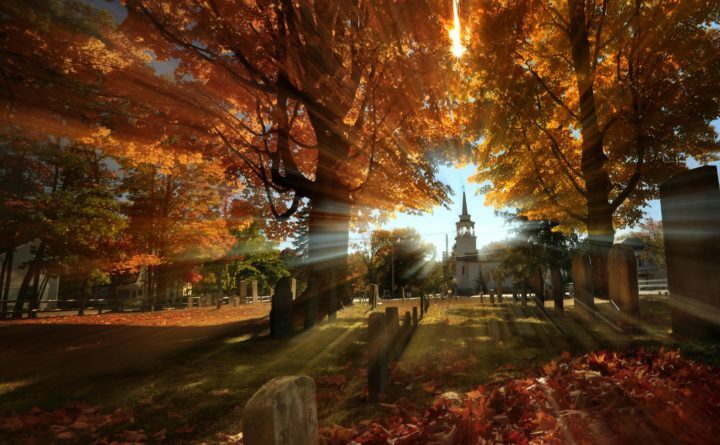 In this Oct. 10, 2016, file photo taken with a slow shutter speed, autumn's colors peak on hardwood trees in a cemetery near the Congregational Church in Cumberland, Maine. The history of the Congregational Church is the history of Colonial New England. Their records from 1630 to 1800 are being put online by the Boston-based Congregational Library and Archives Hidden Histories project, with a boost of a than $300,000 from a grant from the National Endowment for the Humanities. The history of the Congregational Church is the history of Colonial New England. Before the birth of the nation and the separation of church and state, the plain Congregational churches that date to the time of the Pilgrims and are found in every community in the region chronicled just about every aspect of life. Yet that history remains largely scattered and hidden, tucked away in damp, unexplored corners of church buildings from the coast to the mountains. Now, with the help of a more than $300,000 grant from the National Endowment for the Humanities being announced on Monday, the Boston-based Congregational Library and Archives Hidden Histories project is locating, securing, and digitizing church records from 1630 to 1800 and putting them online for anyone to peruse for free. Some records are already online, but the new grant will allow the project to digitize an additional 18,000 documents and transcribe about 7,000 of them, said James Cooper, director of the Hidden Histories project. The Congregational Library and Archives already has the records of about 40 churches online. But most of them are from Massachusetts. The library has records from two Maine churches, the First Parish Church in Brunswick, founded in 1735, and the North Parish Congregational Church in Sanford, founded in 1786. Others, like the 1714 First Congregational Church of Kittery Point, the 1793 Congregational Church in Cumberland and 1800 First Congregational Church of Brewer are not currently listed in the records archives, for instance. The grant will help the project branch into the rest of New England, Executive Director Margaret Bendroth said. The church was the dominant religion in Colonial New England and the focal point of every community, Cooper said. And because of that, the records contain more than just information about births, baptisms, marriages and deaths. And fortunately, the ministers, often the town’s sole record keeper, wrote everything down. Often in meticulous detail. “They provide an amazing insight into the lives and minds of ordinary folks,” Cooper said. The documents are of immeasurable value to anyone “exploring political culture, social history, linguistics, epidemiology and climatology … as well as to genealogists and members of the public interested in a range of subjects,” The National Endowment for the Humanities said in its announcement. Cooper, a professor emeritus of history at Oklahoma State University, has spent almost three decades tracking down the records, often forgotten by modern day congregations. “A staggering amount of the records are scattered in small local libraries, historical societies and still within churches, and historians haven’t been able to use them because they are utterly inaccessible,” Cooper said. They are crumbling, rotting, and water stained. He’s found them stuffed in pantries next to cans of tomato sauce; wedged into coat closets; and in a safe to which no one associated with the church had the combination. In one case, a church member put the records in a bank, and then died without telling anyone where they were. “These records are an absolute gold mine,” Cooper said.